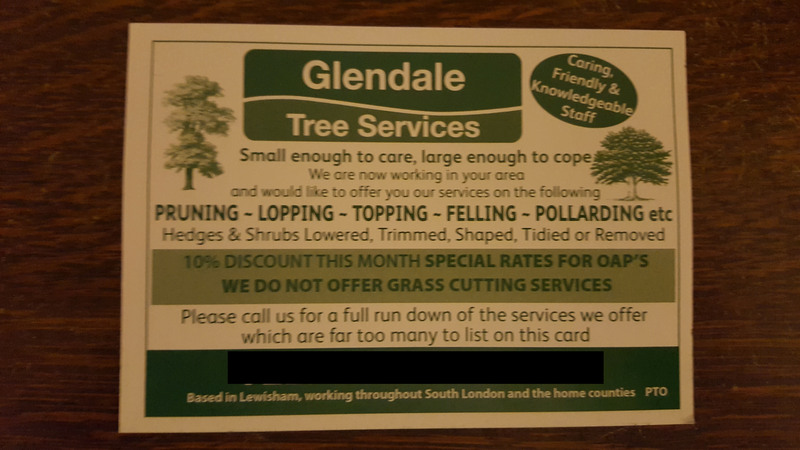 “It has come to our attention that an organisation called Glendale Tree Services is currently operating in the London area (in particular around Lewisham) and adopting quite unscrupulous business practices. We would like to reassure our customers, clients and members of the public that this organisation is in no way affiliated with, or endorsed by Glendale. Our teams are easily identified by their uniforms which are made up of black trousers, a green t-shirt, fleece or jumper and a high visibility jacket. The uniform features the organisation’s logo. Our vehicles are bright green and also feature our logo and our web address. In addition, unless we are working in partnership with a local council or housing association, we do not undertake domestic work.